AAPL is struggling to hold above a crucial ‘Hidden Pivot’ support at $170, but if it gives way expect the broad averages to take another nasty leg down in sympathy. The stock is sufficiently oversold to be primed for a bear rally of perhaps 8-10%. But who would do the buying? Ordinarily, short-covering is the only source of bids strong enough to excavate a stock from a trough as deep as the one AAPL has fallen into over the last month. But a bear squeeze seems increasingly unlikely now that the threat of a tariff on iPhones is in the news. Trump said Tuesday that he was considering broadening the trade war against China with levies on some high-volume consumer electronics products, including the iPhone. This could significantly impact the Cupertino retailer’s bottom line, since Apple is already meeting stubborn price resistance from consumers who seem to have discovered they can live without the latest iPhone model for an additional year or two. Even if Apple ultimately dodges the tariff bullet, uncertainty about the outcome is likely to persist in the months ahead. Under the circumstances, investors should prepare for more weakness in Apple shares, which could drop quickly to the 162.43 target I broached here recently. With AAPL currently trading for around 174, that would represent a 6.6% fall and a 30% decline from the all-time high of 233 recorded nearly two months ago. ______ UPDATE (Nov 28, 2:13 p.m.): Tariffs shmariffs. What on earth was I thinking!!?? Fear of them is having zero effect at this moment on AAPL, which has blasted into the go-ahead zone with a mid-day short squeeze. 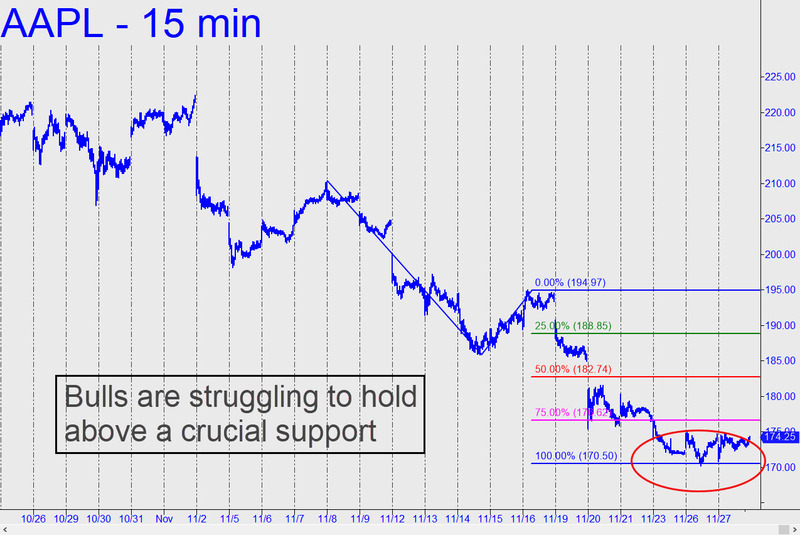 It has removed the $170 support as an immediate concern and made the 10% rally noted above an odds-on bet. AAPL is of course a lead indictor of the markets as it had hit that 1 Trillion 1st time cap level. 1) ………Since 1946, there have been 18 midterm elections. Stocks were higher 12 months after every single one. Every single one. That’s 18 for 18. Even though we’ve had every possible political combination in the past 72 years. Republican president with Democratic Congress. Democratic president with Republican Congress. Republican president and Congress. Democratic president and Congress. 2) Markets Traded in USD are now 90% in the Red a ‘Worst Year Since 1901’. These are the 2 most important stats to watch and observe over the coming 12 months, if the 18×18 win towards market stats of being higher the next 18 months fail we are in something much larger than at any time since the last century data points. The tell of such a larger than expected turn towards the financial well being of the nation and world is number 2), which markets traded in USD are already 90% red, something not seen ever since 1901. Margin levels to observe is REG T NYSE this is the 50% dollar amount needed to place longs towards stock value in an account (any account) ‘Maintenance margin’ is the stat to observe as this is 25% NYSE cost to stabilize and kept the positions alive and running on the long side. All Funds observe 5% and 10% levels in the counter trend mode as important add on levels and trigger sell levels at 15% which leaves panic levels at 20%+/- counter trend levels. The 18-22% counter trend price levels in indexing is a place where the rip cord is pulled and accounts are adjusted towards trying to hold and maintain a long term curve of rising equity levels. This is why you will observe such large swings at the long term counter trend 20%+/- average index levels because of NYSE Maintenance margin rules kick in towards ‘maintenance margin’ positioning, as once accounts are hit one must meet NYSE require of then rising all accounts towards 33% ‘cash levels’ for that adjustment. Thus creating downward ‘air gaps in pricing. Because of the older and longer term thinking towards retirement funding, we saw in the year 2000 401k moving towards that 201k level, then recovering though the next rotating of new issue equity growth in 2007/08 and lower again. This 3rd blow off may be quite different as if points 1 and 2 are longer term in nature the long term 18×18 wins for rotating may never take hold as the entire system of financial new worth towards all investments may have a greater turn many cannot seen or expect. Investment itself may have simply no where to go and seeing 401k move towards 51k as a wash out and entire generation of wealth. The 1st leg lower could be not in months this time but in ‘quarters’ ( time wise) and the rally thereafter may become something quite worst then the 1930 counter trend high leading towards a 90% decline in over all value in the next few years. The changing of the entire interest rate environment may be the spike in change this last FED cycle of being 2 times as long now 630 +/- trading days, giving the suggestion that a generational turn in interest rates is starting to take place. A reactionary new low may become the ‘test’ low of that change moving towards a complete new set of rules for the next generational turn in how to invest in the markets. Mid 1980’s levels in all investments? Suggesting the above 2 points points above are confirm in the coming year will in time become a reality of fact.